Lemax Twas The Night Table Piece depicts a childhood home on Christmas eve during a visit by Santa, whilst a storyteller reads Twas The Night before Christmas. Santa's sleigh and Reindeer sit on the rooftop whilst Santa delivers the presents beneath the tree. A child can be seen looking outside his bedroom window to try and catch sight of their arrival! 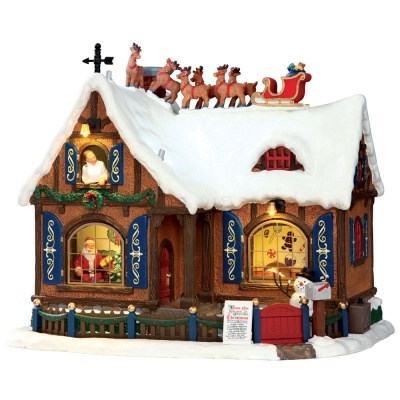 Musical and vocal soundtrack makes this a delightful Lemax Village building, along with inside viewable window scenes where Santa can be seen from outside. Lemax Twas The Night is a Sights & Sounds animated table piece with exterior and interior illumination, and a storytelling soundtrack suitable for placement in and amongst a seasonal Lemax village Christmas scene. A recent addition Lemax Caddington Village themed collectable table piece which joined the Lemax collection in 2015. Twas The Night offers a delightful self standing porcelain and polyresin construct building, on an individual snowed base, to compliment your seasonal Lemax Village.